How do we critique films? Click Here To See. 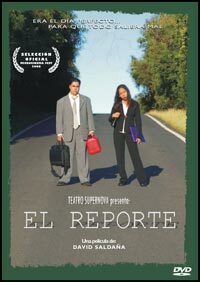 El Reporte (The Report) is the debut film from Puerto Rican director David Saldaña. It is the story of Bernie, who is (to quote Office Space) a “straight shooter with upper management written all over him.” Bernie’s goal is to advance in his corporate job as quickly as possible and eventually achieve a high-level, well-paid position in the company. He takes himself and his job very seriously, to the point of using his personal cell phone for company work in order to get even more work done, thus increasing his chances of rapid advancement. One day, Bernie is asked by his supervisor to travel to San Juan to present the firm’s annual report to Cabrera, the company president. Cabrera is known for being very hard-to-please, so Bernie is reluctant at first; but the chance to show his hard work (and keep his job, as his boss made clear) is an opportunity he can’t afford to pass up. He is told to be at the corporate headquarters in San Juan promptly at 3:00 the next day and to take his co-worker Marisol along as an assistant. Bernie is anxious to get an early start, knowing that they have to drive from their hometown of Mayagüez on the western coast of the island to get to San Juan, about 100 miles away on the northeastern coast. To ensure that they have enough time to make the drive, he picks Marisol up at 6:00 in the morning. After hearing on the radio about potentially large traffic jams due to a trucker strike, they decide to take the backroads. Bernie is so hellbent on getting to San Juan as soon as possible that he refuses to stop and help an older gentleman whose car has broken down by the side of the road. As they continue on the backroads, Bernie ends up getting hopelessly lost, which he of course says is Marisol’s fault for not paying attention. He finds a map, but it turns out to be useless, as it has a large hole right in the area they’re stranded in. Frustrated, Bernie eventually finds the way back to a main road, where soon after, the car runs out of gas. This does not bode well. To make a long movie short, Bernie and Marisol encounter several other mishaps along the way to San Juan, nearly all of which he blames her for, but which in fact could have been avoided with a little preplanning and patience on his part. Through it all, Marisol encourages Bernie to slow down, but it’s not until the end of the film that he understands the benefit and wisdom in doing so. There are times when I was expecting the film to make its point too apparent and start beating you over the head with it… but it doesn’t. There are times when things get a bit predictable (after running out of gas, they get a flat tire, and after that, Bernie gets a ticket for driving to fast, and then…); but at the same time, the predictability is excusable because it is specifically due to Bernie’s shortsighted impatience and frustration at other people and his circumstances. Also, Saldaña makes great use of circularity: people that Bernie had ignored earlier pop up again later, specifically at times when he is in need of help.